"Square roots" redirects here. For other uses, see Square Roots (disambiguation). For example, √25 = 5, since 25 = 5 ⋅ 5, or 52 (5 squared). In mathematics, a square root of a number a is a number y such that y2 = a; in other words, a number y whose square (the result of multiplying the number by itself, or y ⋅ y) is a. 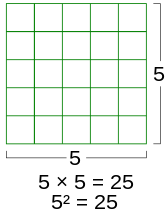 For example, 4 and −4 are square roots of 16 because 42 = (−4)2 = 16. 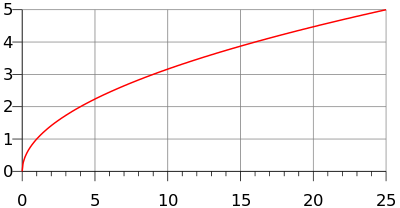 Every nonnegative real number a has a unique nonnegative square root, called the principal square root, which is denoted by √a, where √ is called the radical sign or radix. For example, the principal square root of 9 is 3, which is denoted by √9 = 3, because 32 = 3 · 3 = 9 and 3 is nonnegative. The term (or number) whose square root is being considered is known as the radicand. The radicand is the number or expression underneath the radical sign, in this example 9. Every positive number a has two square roots: √a, which is positive, and −√a, which is negative. Together, these two roots are denoted as ±√a (see ± shorthand). 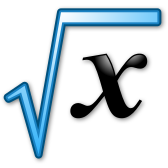 Although the principal square root of a positive number is only one of its two square roots, the designation "the square root" is often used to refer to the principal square root. For positive a, the principal square root can also be written in exponent notation, as a1/2. as it allows one to adjust the estimate x by some amount c and measure the square of the adjustment in terms of the original estimate and its square. 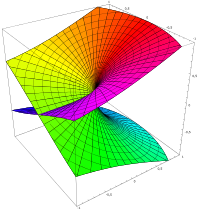 Furthermore, (x + c)2 ≈ x2 + 2xc when c is close to 0, because the tangent line to the graph of x2 + 2xc + c2 at c = 0, as a function of c alone, is y = 2xc + x2. 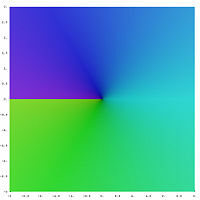 Thus, small adjustments to x can be planned out by setting 2xc to a, or c = a/(2x). The choice of the principal roots yields the solutions given above. from modular arithmetic. Here, the element 1 has four distinct square roots, namely ±1 and ±3. On the other hand, the element 2 has no square root. See also the article quadratic residue for details. 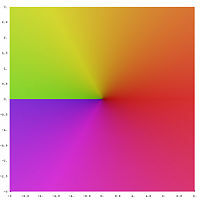 in which the element −1 has an infinitude of square roots including ±i, ±j, and ±k. A square root can be constructed with a compass and straightedge. In his Elements, Euclid (fl. 300 BC) gave the construction of the geometric mean of two quantities in two different places: Proposition II.14 and Proposition VI.13. Since the geometric mean of a and b is √ab, one can construct √a simply by taking b = 1. Euclid's second proof in Book VI depends on the theory of similar triangles. Let AHB be a line segment of length a + b with AH = a and HB = b. Construct the circle with AB as diameter and let C be one of the two intersections of the perpendicular chord at H with the circle and denote the length CH as h. Then, using Thales' theorem and, as in the proof of Pythagoras' theorem by similar triangles, triangle AHC is similar to triangle CHB (as indeed both are to triangle ACB, though we don't need that, but it is the essence of the proof of Pythagoras' theorem) so that AH:CH is as HC:HB, i.e. a/h = h/b, from which we conclude by cross-multiplication that h2 = ab, and finally that h = √ab. 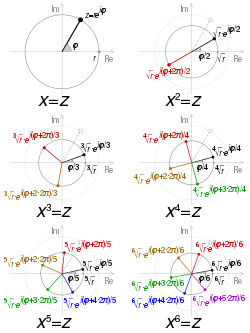 When marking the midpoint O of the line segment AB and drawing the radius OC of length (a + b)/2, then clearly OC > CH, i.e. (a + b)/2 ≥ √ab (with equality if and only if a = b), which is the arithmetic–geometric mean inequality for two variables and, as noted above, is the basis of the Ancient Greek understanding of "Heron's method". Another method of geometric construction uses right triangles and induction: √1 can, of course, be constructed, and once √x has been constructed, the right triangle with legs 1 and √x has a hypotenuse of √x + 1. 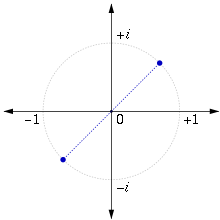 Constructing successive square roots in this manner yields the Spiral of Theodorus depicted above. ^ "Analysis of YBC 7289". ubc.ca. Retrieved 19 January 2015. ^ Heath, Sir Thomas L. (1908). The Thirteen Books of The Elements, Vol. 3. Cambridge University Press. p. 3. ^ Dauben (2007), p. 210. ^ "The Development of Algebra - 2". maths.org. Archived from the original on 24 November 2014. Retrieved 19 January 2015. ^ * Oaks, Jeffrey A. (2012). Algebraic Symbolism in Medieval Arabic Algebra (PDF) (Thesis). Philosophica. p. 36. Archived (PDF) from the original on 2016-12-03. ^ Manguel, Alberto (2006). "Done on paper: the dual nature of numbers and the page". The Life of Numbers. ISBN 84-86882-14-1. ^ Parkhurst, David F. (2006). Introduction to Applied Mathematics for Environmental Science. Springer. p. 241. ISBN 9780387342283. ^ Solow, Anita E. (1993). Learning by Discovery: A Lab Manual for Calculus. Cambridge University Press. p. 48. ISBN 9780883850831. ^ Heath, Sir Thomas L. (1921). A History of Greek Mathematics, Vol. 2. Oxford: Clarendon Press. pp. 323–324. ^ "Function sqrt". CPlusPlus.com. The C++ Resources Network. 2016. Archived from the original on November 22, 2012. Retrieved June 24, 2016. ^ Overland, Brian (2013). C++ for the Impatient. Addison-Wesley. p. 338. ISBN 9780133257120. OCLC 850705706. Archived from the original on September 1, 2016. Retrieved June 24, 2016. ^ Cooke, Roger (2008). Classical algebra: its nature, origins, and uses. John Wiley and Sons. p. 59. ISBN 0-470-25952-3. Archived from the original on 2016-04-23.